Repairs to the Scarborough Covered Bridge are complete. I'm happy to report that structural repairs to the Scarborough Covered Bridge have been completed a week ahead of schedule, and the road has been reopened to all traffic as of Friday afternoon. I'd like to personally thank neighbors along Covered Bridge Road, as well as those who use Covered Bridge each day for patience and cooperation as this work was completed. In case you missed last week's news, the Township has awarded a contact for work on the 2017 Road Maintenance Program, the annual Capital Improvement Program to reconstruct portions of Township-owned roads in need of repair. The $3.5 million contract will fund work on nearly 30 local streets; combined with the work currently being done as part of the 2016 program, a total of nearly 60 local roads are being repaired this year! You can click here to find a list of the roads scheduled for reconstruction as part of both years' programs. My administration and Town Council continue to prudently invest in our town's infrastructure, and are continually working to ensure that our roads are smooth and safe for travel. If you have a question about our Road Maintenance Program in general, or about a road in your neighborhood, please reach out to my office at (856) 488-7878, call our Engineering Department at (856) 424-3203, or report it through our Township website. Councilwoman Carole Roskoph speaks to players and coaches at Cherry Hill National's closing ceremonies on June 17. Councilwoman Carole Roskoph and Councilman Jim Bannar joined families from Cherry Hill National Athletic League last Saturday for their 2017 closing ceremonies and award presentations. It was a beautiful afternoon, with food, prizes and games for players and their families. Cherry Hill is fortunate to have so many wonderful youth athletic leagues for our families to choose from, and National is no exception! Thank you to the players, coaches and board members for inviting us to take part in the festivities -- and congratulations to all this year's teams on another tremendous season! Click here for photos of Saturday's festivities. 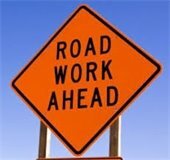 NJDOT is continuing its nightly repairs along Route 70 throughout the Township, with work scheduled to continue next week in the areas between Route 38 and Haddonfield Road and Kings Highway and Cooper Landing Road. Crews are working to complete concrete slab removal and patching, as well as installing traffic markings. Once slab removal is complete, NJDOT expects to begin paving in the vicinity of our Erlton/Barclay/Kingston neighborhoods; that work will likely begin in late summer. Crews are operating overnight, from 9 p.m. to 6 a.m. daily, weather-permitting. The project is progressing quickly, but work is expected to continue into the fall of 2017. Ultimately, the project will significantly improve driving conditions on the highway. The Township will make every effort to keep residents, businesses and motorists updated on weekly work schedules, as information is made available by NJDOT. The precise timing of the work is subject to change due to weather or other factors. Motorists can visit www.511nj.org for real-time travel information or follow NJDOT on Twitter @NJDOT_info. The Camden County Mosquito Control Commission has begun its annual spraying for mosquitoes, and will be spraying in neighborhoods across Cherry Hill for the next several weeks in an effort to limit growth of our area's mosquito population. During the summer and fall months, the commission schedules spraying on an as-needed basis, based upon the results of their surveillance efforts and input from the public. Visit the Township website and social media pages for local spraying schedules, as they are announced by the County. Visit www.camdencounty.com for more information about the Moquito Commission, and for tips you can use to help eliminate mosquito breeding in your own yards. For more information, or to inquire about spraying in your area contact the Mosquito Commission directly at (856) 566-2945. Operation Yellow Ribbon of South Jersey is asking for the public's help to push them over the top, to the $50,000 grand prize in the Wawa Foundation's Hero Award contest. OYR is one of four finalists in this year's contest, and the $50,000 prize will help to fund morale-boosting care packages for U.S. military personnel deployed to the Middle East. How can you help? 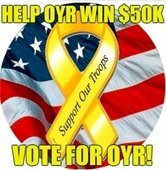 Vote for OYR by clicking here, then spread the word and ask others to do the same! Visit Operation Yellow Ribbon on Facebook to find the contest post, and share it with your friends and followers. You can vote until June 29. The Wawa Foundation Hero Award will be announced during a ceremony July 4 at Independence Hall in Philadelphia. The winner will receive $50,000; the three runners-up will receive $10,000 each. Our community is grateful for the wonderful work the volunteers at Operation Yellow Ribbon do throughout the year to help remind our deployed troops that they are valued and appreciated, and we are happy to help support them in this endeavor. To learn more about OYR, visit www.OperationYellowRibbonSouthJersey.org. The Cherry Hill Police Department has once again partnered with 7-Eleven Inc. to participate in Operation Chill. The program allows law enforcement officers to reward children they observe doing good deeds or exhibiting positive behavior with a coupon for a free Slurpee. The program started in Philadelphia in 1995 to give law enforcement officers a chance to interact with children and teens in a non-threatening situation. Our officers are very excited to get started this summer and begin building relationships with children and teens in our community, so keep an eye out for officers in your neighborhood! The Cherry Hill Police Department will conduct a sobriety checkpoint during the weekend of July 1, as part of ongoing efforts to deter intoxicated drivers. The Department schedules these targeted enforcement efforts at various times throughout the year, to make roadways safer by deterring and apprehending intoxicated drivers. High-visibility enforcement and media attention have made checkpoints an effective tool in removing impaired drivers from the roadways. If you plan to drink, please designate a driver before you go out, or plan to take mass transit or a taxi, to ensure your safety, and the safety of all those around you. For more information about this enforcement effort, click here. Don't miss another great year of Music Under the Stars at historic Barclay Farmstead! Music Under the Stars returns to Barclay Farmstead this summer! We are less than a month away from our first Music Under The Stars show at Barclay Farmstead! The free, family-friendly summer concert series kicks off July 11, and continues every Tuesday in July, weather-permitting. Each week's show begins at 6:30 with an up-and-coming opening act, followed by an exciting headliner who's sure to keep you up and dancing. This year's headliners are Lights Out, a Frankie Valli tribute, on July 11; Parrotbeach, a Jimmy Buffet band, on July 18; and Separate Ways, a Journey tribute, on July 25. Come hungry! Delicious food items will be available for purchase from Not Your Mama’s Tacos, Rob’s Craft Sandwiches, Olde City Kettle Corn and M&A&A Ice Cream (subject to change). Bring your blanket, a chair, and even a picnic dinner - just don't forget your appetite for great music! These concerts are FREE and open to the public. Thank you to Kennedy Health for their support of this year's series. For more information please call (856) 488-7868 or email Events@CHTownship.com, or check out our Facebook event! Pop-up Story Time in the Park returns in July! Click here for photos from last year. For more information, contact the Cherry Hill Library at (856) 667-0300 or Cherry Hill Recreation Department at 856-488-7868 or visit www.chplnj.org. Explore 'Cherry Hill's Hidden Historic Gems' at the Cherry Hill Library. The Cherry Hill Historical Commission is proud to present its new exhibit, “Cherry Hill’s Hidden Historic Gems." Located in the Local History Room on the lower-level of the Cherry Hill Public Library, this new exhibit calls attention to nine special places in Cherry Hill that are remnants of our township’s past. For example, learn more about the 186-year-old stone pictured here – including where it once was and where it hangs today. This exhibit is presented by the Cherry Hill Historical Commission, and I thank the commission and its volunteer members for their continued work to preserve and protect our Township's past. Registration is OPEN for the second Book It 5K, 8:30 a.m. Saturday, Sept. 23, at the Cherry Hill Public Library. The race is a partnership between the Township and CHPL, and will include both the 3.1-mile race, a 1-mile walk, and a 100-yard Kids' Dash. Tech t-shirts will be given to the first 250 5K and Walk registrants; medals will be awarded to the top three male and female runners in each age group. All children will receive a prize following the dash. Visit the Book It 5K Run Sign-Up Page to register online, and for full event details. Thank you to our Wellness Partners, Kennedy Health, Ravitz Family Markets and Virtua for their support of this event. Cherry Hill is a wonderful place for seniors to flourish close to family, friends and members of their religious and social communities. With so many programs that benefit seniors, it is a good idea to sign up for regular updates on events from the Township, County, Cherry Hill Library, and the State. Besides this Weekly Briefing email, you can sign up for other Township notifications by clicking here. Find out about Library news and events by visiting www.chplnj.org. Learn of all the events happening “Just for Seniors” from Camden County by signing up for the weekly county newsletter. For a complete listing of Senior Programs from the State of Ne Jersey, click here. Remember: The Township has a senior services program coordinator to assist our over-55 residents with any issue, question, or navigating the world of senior services and resources at every level. That coordinator, Gaye Pino, works inside our Recreation Department (Room 102, Town Hall) and is available to answer questions about any issue or service of interest to our residents over the age of 55, including classes, activities, clubs, special events and housing. The coordinator is also a valuable resource and guest speaker for local senior groups and organizations. If you or someone you know is in need of assistance, call (856) 661-4800, or e-mail gpino@chtownship.com.